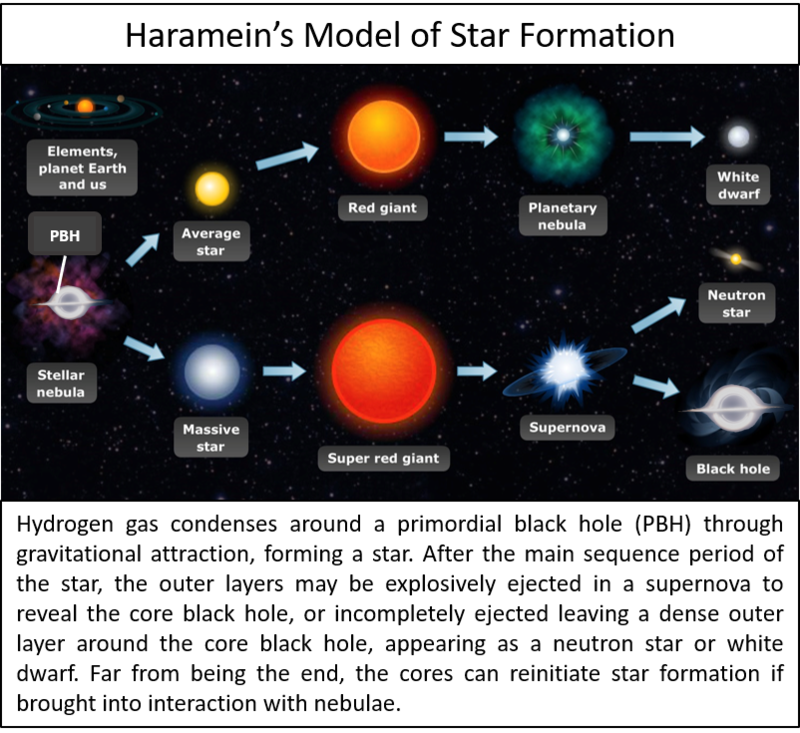 Haramein’s theory is contrary to the conventional model of galactic, stellar, and black hole formation. Look up any source and it will invariably describe how black holes form from the core collapse of massive stars (greater than 20 solar masses). In short, the conventional model states that once a massive star has reached its limit for continued thermonuclear fusion—which for even the most massive stars stops at the element iron—then there is no longer sufficient energy radiating outward to counter-balance the inward gravitational force of the star. The star thus undergoes gravitational collapse forming a stellar remnant in the form of a white dwarf, neutron star or black hole. Incidentally, there is another crisis brewing in astrophysics as it has become clear that the conventional model cannot explain where elements heavier than iron come from: it used to be assumed that all elements heavier than iron are formed during the supernova explosion resulting from core collapse of the massive stars, but calculations have shown this not to be a viable scenario. Interestingly, black holes (specifically primordial black holes—not resulting from stellar gravitational collapse) have now been implicated in the formation of elements heavier than iron (see RSF science news post small primordial black holes implicated in formation of heavy elements). Returning to the terminal processes “ending” the life of our massive star, once the outward radiative pressure is gone, the star begins to collapse. If the star exceeds the Tolman-Oppenheimer-Volkoff limit (TOV limit), its mass will be so great that the core collapses into a singularity, infinitely curving spacetime, forming a black hole while the outer layers of the star compress into a final thermonuclear fusion event that releases the energy equivalent of billions of stars, known as a supernova. 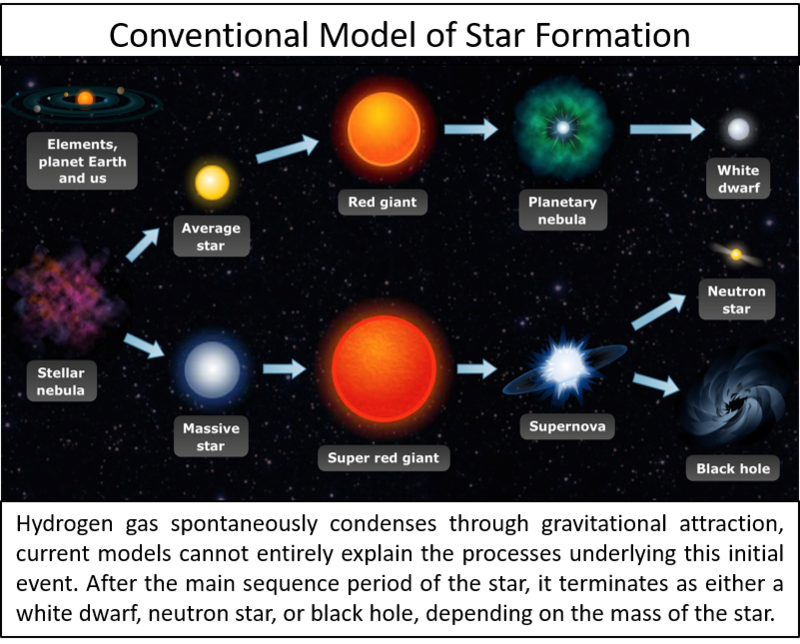 The supernova sends shockwaves of plasma and “star stuff” out, which may trigger gravitational condensation in nebulae, birthing more stars, while the core that has collapsed to a singularity is masked behind a light-like boundary known as the event horizon. That is the conventional model in a nutshell—black holes, neutron stars, and white dwarfs are the corpses of dead stars. There are numerous problems with this theory, but none perhaps has been as unsettling to astrophysicists as the recent observation of supermassive black holes that reside at the edge of the visible universe (Discovery of an Ancient Supermassive Black Hole is Upending Conventional Theory of Star and Galaxy Formation), and hence are some of the oldest structures in the universe. This is a problem, because if black holes are formed from stellar collapse, then how can supermassive black holes be present when the first stars were just beginning to form? Looking at Haramein’s model, the answer is simple—black holes form first, during the early epochs of the universe when energy densities were extremely large, and they then act as the nucleating centers guiding star and galaxy formation. The idea may seem remarkable but looking at standard models of cosmology it is known that immediately following the so-called Big Bang energy densities will be so great that black holes will be produced in vast quantities. What’s more, calculations show that the size of the black hole is determined by the time-evolution following the Big Bang, which is to say that black holes smaller than a stellar mass could have formed in the earliest stages, known as primordial black holes (PBHs). So, at a Planck time after the Big Bang, which is ~10-43­s, black holes of the Planck mass (~10-5g) would form (see Bernard Carr, Quantum Black holes as the Link Between Microphysics and Macrophysics, 2017). Haramein has utilized these Planck-sized black holes, referred to as Planck Spherical Oscillators in his paper Quantum Gravity and the Holographic Mass, to calculate the exact mass of objects from elementary particles to stars and astronomical black holes using spacetime quanta, discovering a scale-invariant quantum gravitational solution. At one second after the Big Bang, PBHs of a 100 thousand solar masses would form. Accordingly, in the span between the Planck second and 1 second, an enormous range of black hole masses would have formed. Note that it is commonly held that black holes of a proton size or smaller (~1015g), would almost immediately “evaporate” due to Hawking radiation, however there is good reason to believe that Hawking radiation is not a purely evaporative process, but in fact that quantum mass fluctuations around the event horizon can feed black holes, keeping their mass constant or even increasing the mass (see Maroc Spaans, On Quantum Contributions to Black Hole Growth, 2013). Even if Hawking radiation is considered in its bare-form, which stipulates that the evaporative rate is inversely correlated with the mass of the black hole, researchers like Rovelli and Vidotto have described how proton-sized black holes will appear to “freeze” due to time dilation, and will therefore appear stable to outside frames of reference (all those that do not include the event horizon or traveling at light speed) for periods longer than the current age of the universe (see our article Planck Stars: quantum gravity research ventures beyond the event horizon). Looking at this early formation raises the intriguing question, could protons be primordial black holes? As well, could supermassive black holes have formed in a short period following the Big Bang, where they would then be present during the first star formation (known as population III stars)? Cosmologists generally give a cut-off value for PBH formation of a few hundred solar masses, but recent observations are suggesting that the model is not entirely accurate. These observations include the detection of black holes outside of the expected mass-range predicted by the conventional stellar-collapse model, detected using the laser interferometry gravitational-wave observatory (LIGO). These “anomalous” black holes were above the expected mass range of 10 to 20 solar masses (which have raised the possibility that so-called dark matter could be primordial black holes). A prominent recent observation that is throwing the current model into question is the observation of quasars at the edge of the visible universe, with one residing 13.04 billion light years from Earth (meaning it formed earlier than 690 million years after the Big Bang) and housing a black hole close to a billion solar masses. An interesting observation is made when astronomers peer back to the earliest epochs of the universe, there are objects at the edge of the visible universe—which is to say that we are receiving the light they emitted close to 13 billion years ago. Since their discovery, scientists have eventually come to understand the nature of these enigmatic luminous progenitors, they are young galaxies that are extremely luminescent due to the activity of a supermassive black hole at their center, what’s referred to as active galactic nuclei (AGN). This fact was an important corroborative finding for Haramein’s model of galaxy and star formation, because the key concept is that black holes are at the center of all galaxies, where they act as the nucleating centers for galaxy accretion, determine the number of stars that are formed, and exert an overall considerable influence on the architecture of galactic systems. 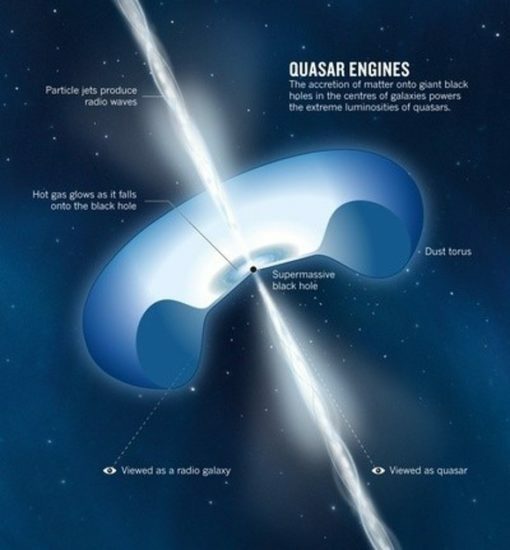 Recent SDSS (Sloan Digital Sky Survey) studies have found a quasar that existed 690 million years after the “big bang”. It is estimated that for a quasar to be visible at such great distances the mass of the central supermassive black hole should be around 1 billion solar masses. Based on the conventional theories of black hole formation and growth—via stellar death—this far exceeds that of the expected mass, which have conventionally calculated black holes at this stage in cosmic evolution to be only a few hundred solar masses. Note, this predicted mass for the first black holes is based on the assumption that these “seed” black holes are remnants of the first stars – known as Pop III stars – which were formed as a result of the primordial gas cooling when the Universe was approximately 200 million old. The conventional cosmological model suggests that because these original black holes would be forming in close proximity they would eventually merge to form more massive black holes of several thousand solar masses. However, albeit more massive, they are still not massive enough to account for the predicted masses of quasar stellar black holes that we see today. So then, how did these behemoths arise so early? One possibility is that the first black holes underwent some hitherto unpredicted extraordinary period of growth. The optimal feeding rate of a black hole is based on the Eddington limit, which describes the maximum rate of growth. Under the Eddington limit, with exponential growth a 10-solar mass black hole could grow to a billion-solar mass black hole in about one billion years. If it was to be maintained that the first black holes come from Population III stars, then they would have to feed at a rate higher than the Eddington rate. This is theoretically possible in dense gas rich environments typical of the early universe. However, such an occurrence would only be possible for short durations – and could also cause dampening because radiation emitted during super-Eddington periods would in effect halt the growth of the black hole. Such a scenario would therefore be a rarity. Another scenario that has been suggested by astrophysicist Priyamvada Natarajan and her colleagues is that the first black hole seeds could have formed without stellar deaths. Instead Natarajan et al. suggests they formed directly from gas, referred to as Direct-Collapse Black Holes (DCBH). Such objects would have formed within a few hundred million years after the big bang with masses of 10-100 thousand solar masses. Large gas disks would usually cool and fragment instigating stellar growth and galaxy formation. However, under Natarajan’s model large gas agglomerates are posited to collapse into dense clumps that directly form seed black holes of 10,000 to 1 million solar masses. She concludes that his could happen if normal cooling processes were halted – that is if molecular hydrogen formation, which aids disk cooling, was stopped such that the disk remains hot. The disk would then be too hot to form stars and as well would be dynamically unstable resulting in contraction until eventual collapse forming a black hole—a DCBH to be specific. As these seed DCBHs grow they would briefly reach a point where their mass is greater than all the stars in their parent galaxy. For this brief moment the parent galaxy is referred to as an obese black hole galaxy (OBG). The mass of all the stars in a galaxy is typically 1000 times greater than the central black hole, so an OBG would have a unique spectral signal, particularly in the infrared wavelength of the spectrum. Natarajan is hoping that with the launch of the James Webb Telescope in 2019 she will be able to find evidence of this unique spectral signal and thus prove the existence of DCBHs. As mentioned, Haramein’s model of early formation of black holes and their importance to the evolution and development of the first stars and galaxies is now seeing corroborating evidence as empirical data comes in that strongly indicates this as a more accurate theory than the conventional model. 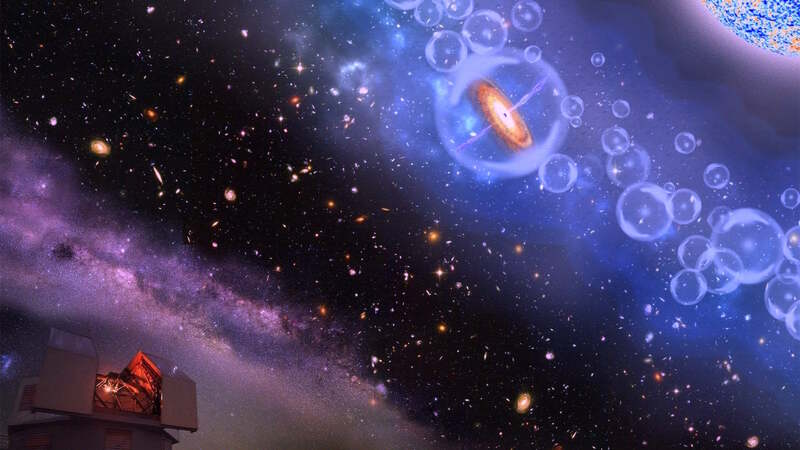 As other researchers work to make sense of the new observations and its contradictions with existing theory, their new models are coming to closely resemble that of the cosmological portion of Haramein’s unified physics model. This is a good sign, because progress in this direction may bring a majority of the scientific community to the Haramein’s unified physics theory that solves dark matter, formation and evolution of stars and galaxies, universal expansion and other unresolved topics in cosmology and astrophysics. Mezcua J. Hlavacek-Larrondo J. R. Lucey M. T. Hogan A. C. Edge B. R. McNamara. The most massive black holes on the Fundamental Plane of black hole accretion. Monthly Notices of the Royal Astronomical Society, Volume 474, Issue 1, 11 February 2018, Pages 1342–1360. Fabio Pacucci, Priyamvada Natarajan, Marta Volonteri, Nico Cappelluti, C. Megan Urry. 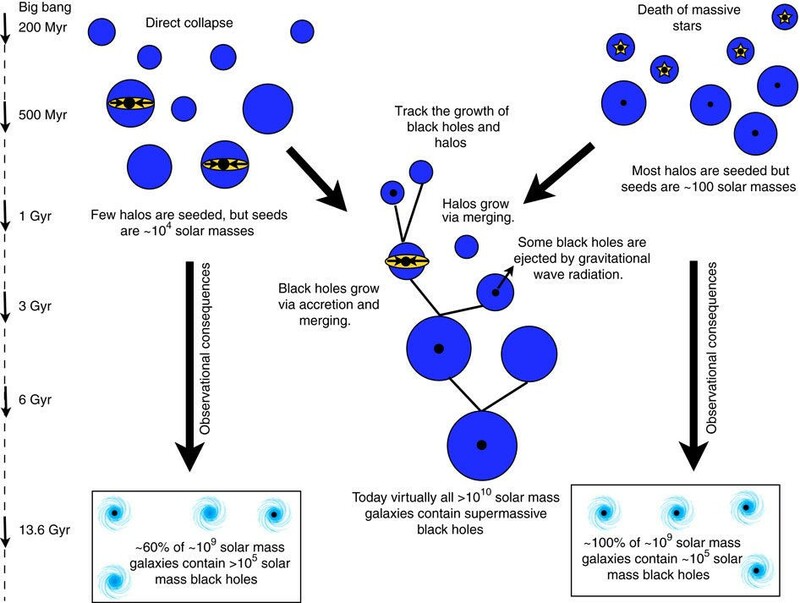 Conditions for Optimal Growth of Black Hole Seeds. The Astrophysical Journal Letters, Volume 850, Number 2, 1 December 2017. Priyamvada Natarajan. The Puzzle of the First Black Holes. Scientific American, 1 February 2018.